Two men were arrested after police found more than $700,000 in cash and drugs at two Calgary homes in southeast Calgary. 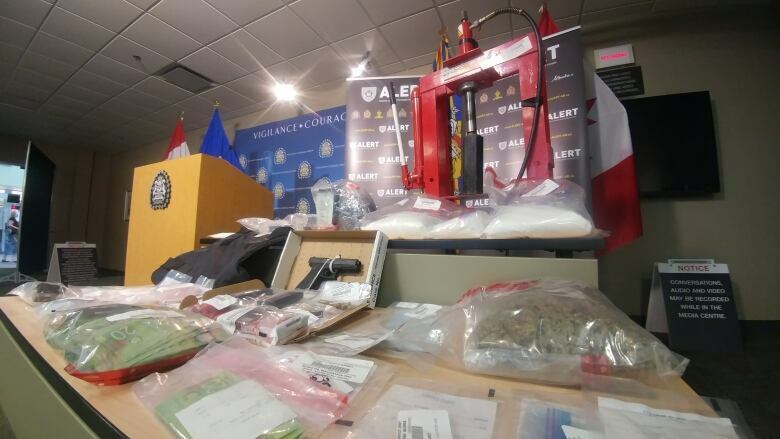 Two men were arrested after police found more than $700,000 in cash and drugs at two homes in southeast Calgary. The homes in Copperfield and Douglasdale were searched a week ago, according to a release from the Alberta Law Enforcement Response Teams (ALERT). Officers found 4.5 kilograms of cocaine, 549 grams of heroin, 360 grams of cannabis and $30,085 in cash. Police believe the homes were being used to package and press the cocaine for street-level drug sales. Colton Darby and Ricardo Martinez were arrested without incident. Both men are 21 years old and face almost two dozen drug and firearm-related charges between them. Officers also seized a Glock handgun they think was smuggled in from the United States, along with rounds of ammunition, two prohibited magazines and body armour.